Happy Friday, friends! I’m so excited for the weekend—Chris has both days off, so I can’t wait to spend time with him and finalize some excursions for our trip. This week, I created a massive list of everything I want to see on our Circle Tour of Lake Michigan. When I say the list is massive, I truly mean massive. It’s going to be so hard to narrow it down because I want to do everything! On Wednesday, Chris got off early so we decided to try a new place—Eleven City Diner. It’s this trendy Jewish diner and deli and was one of the best meals I’ve had in Chicago so far. I had the barbecue smoked brisket patty melt, and it was huge! The brisket was so tender, and I loved the sauce. The menu was so huge, it was hard to pick a meal, but now it’ll be hard to try something new next time we go! With the canine flu outbreak, I am trying to be careful and not let Sky play in the dog park with other dogs as often. It makes me sad, but I don’t want her to get sick. I’ve been making it up to her with the Merrick Jerky Chip Treats provided by our friends at Chewy! I know I’m always up for a cookie as a treat, so she would be too. These oven-baked cookies even look like mini chocolate chip cookies. I love that they contain no corn, soy, or wheat. She gobbled the treat up quickly and would easily eat the whole bag if I let her. Thanks for another winner, Chewy! Disclosure: Chewy.com sent me the Merrick Jerky Chip Treats to review. No further compensation was received, and all opinions are my own. 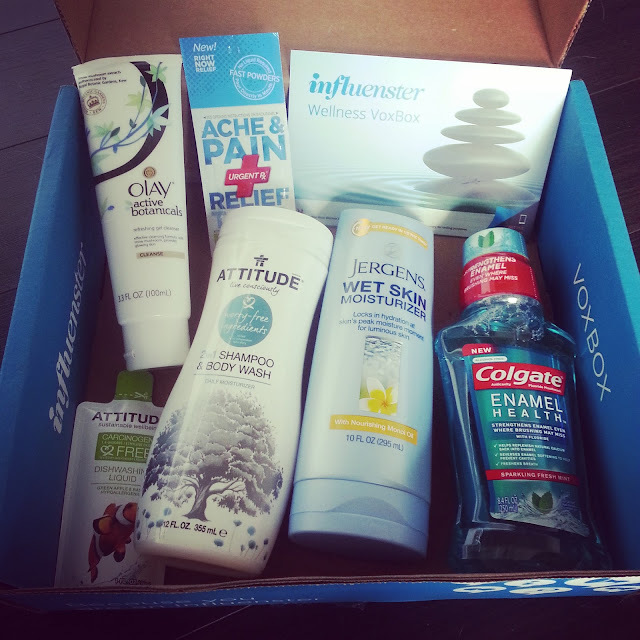 My Influenster Wellness VoxBox came in the mail, and I love trying all the new products. One that really caught my eye is the Jergens Wet Skin Moisturizer. My skin gets insanely dry after I shower, and I am constantly putting on lotion. I applied this moisturizer before I dried and didn’t have to apply lotion for the rest of the night. This product might just be my new best friend. I can’t wait for football season to start. It signals the start of fall to me (let’s just ignore all those early football games where it is still 100 degrees outside in Texas). The beginning of a season is so exciting because no one has lost yet, and everyone is filled with hope that this is the year. I am playing in two fantasy football leagues for the first time this year (Sarah’s league and one I started in Chicago), so it’ll be a fun fall! oooh after that review i will definitely have to try out that moisturiser! and oh my word that food looks AHMAZING. What a great voxbox you got! And yay for Chris getting off early and you all getting to head out on the town. The food looks yummy! Poor little puppy At least you got some sweet treats for him! That brisket, yum! I know what you mean about having a hard time trying something new next time you visit. I tend to find something I love at restaurants and just continue to order the same thing time and time again! That was a great vox box you got!! I love that mouthwash. It works really well. Happy Friday!! Wow that Influenster box looks like it came with great stuff! Going to need to check out that wet lotion! Mmm that burger looks so tasty, and I love what you got in your VoxBox! Happy Friday! You got some awesome stuff in the influenster voxbox! Im interested in trying out the wet skin lotion. I'm putting that diner on my list for the next time I travel to Chicago. Holy cow! That looks so good! I cannot even deal with how amazing that brisket melt looks! OMG! I want that for dinner now. And yay for football season! I am SO excited! I'm always having to apply a ton of moisturizer too, so I might have to try that one out. And thank god it's football season again! I'm playing fantasy again this year, and I'm trying out fan duel for the first time. It's going to be so much fun! I have heard so much about Influenster, but I have lots of questions. :) Does it take up a lot of your time? Does it take forever to get a Vox Box? I can't wait for football season! Have a wonderful weekend! You and Chris get two whole days together?? Congratulations!! Your trip is going to be so awesome. That patty melt looks sooooo good! I love the voxbox. My skin gets dry right after I shower too, I need a bottle of that moisturizer! i can't wait for college football to start! your meal looks so yummy. Eleven City Diner is so good! We went to Chicago for a family vacation when I was younger and we ate at that deli at least two days in a row! Tell me more about this Influenster stuff. How does it work?? 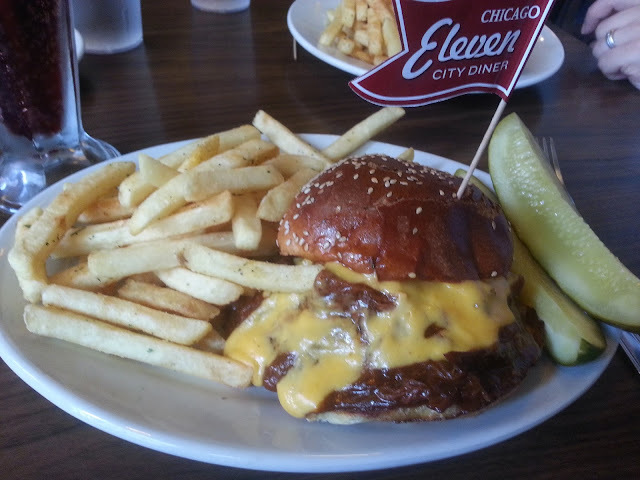 The Eleven City Diner is my favorite spot for breakfast or lunch in Chicago!